Satoyoshi syndrome is a rare disease characterized by alopecia, recurrent muscle spasms, diarrhea, and skeletal abnormalities. Less than 60 cases have been reported in the literature, and majority are reported in the pediatric age group. Adult-onset disease is reported only in five patients. Most of the reports have not characterized the nature of muscle spasm in the disease. ,, In this paper, we report the first case of adult onset Satoyoshi syndrome from India with emphasis on the electrophysiological features and response to treatment. A 30-year-old man presented with complaints of intermittent, recurrent painful multifocal cramps of 2-year duration. It started in the right index finger and progressed to involve the entire body including the axial muscles and jaw. The cramps often resulted in visible jerky movements of various body parts, especially the extremities. Around 1year after the onset of these complaints, he noticed that he began losing hair, and over a period of few months he lost all hair in his body, including pubic and body hair. Two months prior to presentation he started to get recurrent episodes of diarrhea. 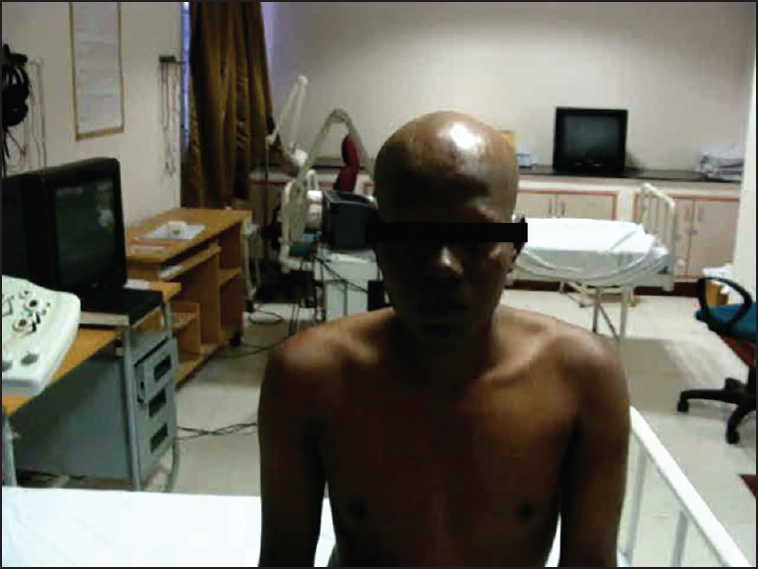 Examination revealed alopecia universalis [Figure 1]. No obvious bony deformities were present. Generalized myokymia was seen, particularly prominent in proximal limb muscles and in the paraspinal region. The myokymic movements were so vigorous that it caused movements of the extremities in the resting position. Rest of neurological examination was within normal limits. Routine lab investigations including hemogram and renal and liver function tests were normal. CSF studies showed acellular fluid with normal protein and sugar. Patient's creatine phosphokinase (CK) was within normal limits (142IU/L). 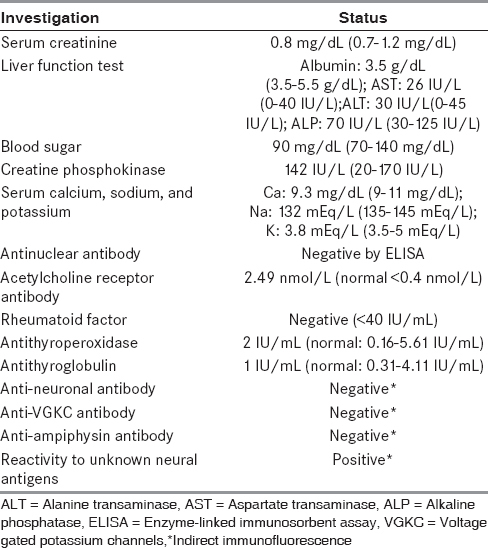 Other relevant metabolic and immunological investigations are given in [Table 1]. The nerve conduction study done showed decreased amplitude of right tibial nerve compound motor action potential (CMAP) from the abductor hallucis. Rests of the parameters were within normal limits. Electromyography (EMG) done in vastuslateralis, tibialis anterior, and biceps revealed fasciculation of 10 hertz frequency and high frequency grouped fasciculation of 50-70 hertz [Figure 2]. 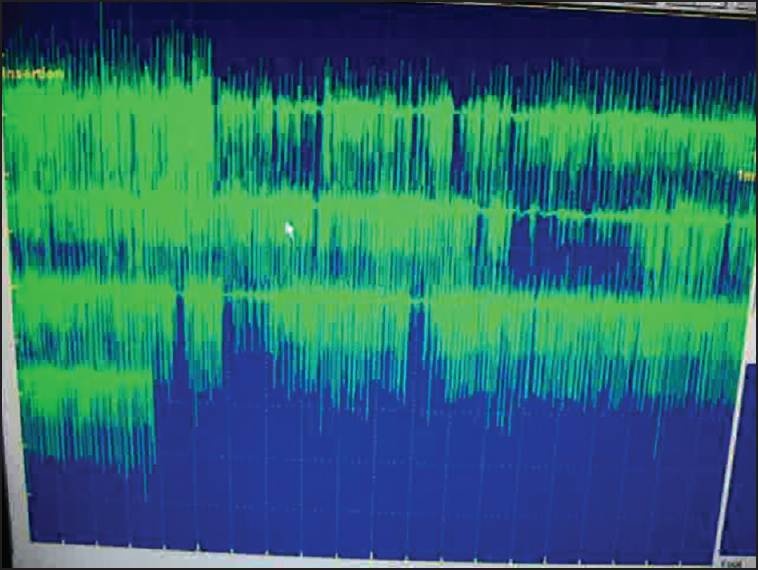 There were also intermittent transient high frequency (150-200 Hz) decremental discharges suggestive of neuromyotonic discharges. The grouped fasciculations were not rhythmic to be termed typical electrophysiological myokymic discharges. Continuous motor unit activity (CMUA) was seen in thoracic paraspinal muscle [Figure 3]. 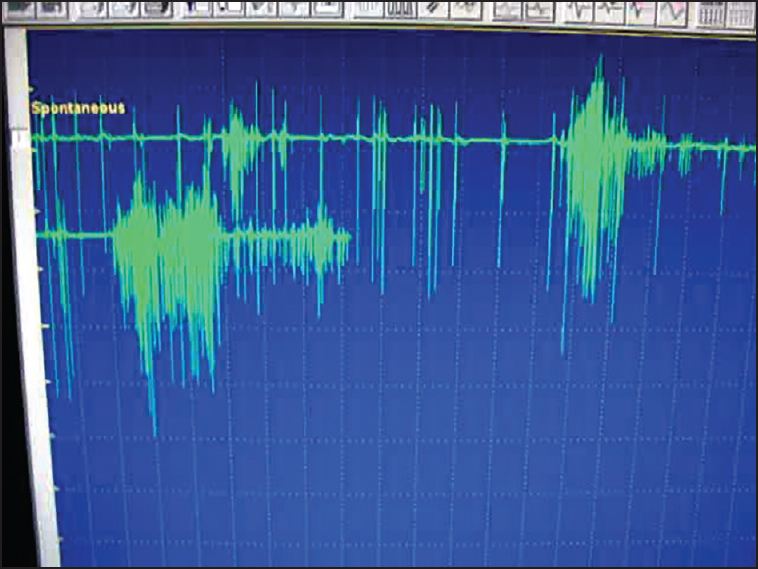 On activation of vastus lateralis, tibialis anterior and biceps, broad large amplitude motor unit action potentials (MUAPs) were found to be interspersed with MUAPs of normal duration and amplitude. Sural nerve biopsy showed mild loss of myelinated fibers in each fascicle with regenerating clusters suggestive of mild axonal neuropathy. Biopsy of vastus lateralis revealed variation in fiber size with atrophic and angulated fibers with some fascicles completely collapsed due to fiber atrophy consistent with mild neurogenic atrophy. X-ray of the left arm revealed nonunion fracture of the shaft of humerus with poor callus formation and osteopenia. Dual-energy X-ray absorptiometry (DXA) scan revealed normal bone density over the lumbar spine. Bone scan showed increased uptake in the region of the fracture. Computer tomography of chest and abdomen was normal. Sigmoidoscopy revealed inflamed colon and biopsy of the colon demonstrated collagenous colitis. As the patient had alopecia, muscle spasms, gastrointestinal, and skeletal complaints; a diagnosis of Satoyoshi syndrome was made. We treated the patient with intravenous methyl prednisolone followed by oral prednisolone and mycophenolatemofetil. With this patient showed improvement and judged on a visual analog scale (VAS) for cramps from 9 at baseline to 5 and pain from 9 to 5. However, this was short lived and within a period of 2 weeks symptoms escalated to a VAS of 7 for cramps and 8 for pain. We tried symptomatic therapy with phenytoin, with no improvement; and in addition the patient had worsening of diarrhea. We initiated treatment with intravenous immunoglobulin (IVIG), but the patient did not show any improvement despite waiting for a period of 4 weeks after therapy. Hence, plasmapheresis was started. Five cycles of plasma exchange were given. Patient had improvement in both cramps and pain with a VAS of 2. The visible myokymic discharges and the associated jerky movements involving the extremities subsided. A repeat EMG showed disappearance of spontaneous activity from vastus lateralis, tibialis anterior, biceps, and thoracic paraspinal muscles. Patient was discharged on steroids, mycophenolatemofetil, and phenytoin and was asymptomatic for his muscle spasms and pain at last follow-up after 2 month of discharge. There was no further episode of diarrhea. However, there was no regrowth of his lost body and scalp hair. Although majority of initial reports of Satoyoshi syndrome were from Japan, isolated case reports are described from other ethnic regions as well. The reports from India are predominantly among children as the usual age of onset of this disease is around 10 years. , Three cases of adult onset disease were described by Ikeda et al., and one each by Heger et al., and Asherson et al. Our report describes the first case of adult-onset Satoyoshi syndrome from India and sixth in the world. We emphasize the nature of 'muscle spasm' as peripheral nerve hyperexcitability, a point infrequently characterized in most of the previous reports. The term peripheral nerve hyperexcitability is preferable to other descriptions like myokymia, neuromyotonia, neurotonia, continuous muscle fiber activity, continuous motor nerve discharges, and muscular pain-fasciculation or cramp-fasciculation syndrome because it has been demonstrated that clinical and electromyographic differences between these descriptions are quantitative rather than qualitative. The electromyographic descriptions of myokymia, neuromyotonia, and fasciculations also tend to follow this thinking. Though our patient had clinical myokymia, we could not find typical myokymic discharges. There were fasciculations, grouped fasciculation, neuromyotonic, and continuous large amplitude motor unit discharges (forming interference pattern) in the same muscle and different muscles sampled at different periods. All these spontaneous discharges subsided following plasmapheresis. Most of the patients reported in the literature have been treated with steroids, muscle relaxants, and phenytoin or carbamazepine with fair response. Our patient differed in that his response to steroid was short lasting. He did not show any response to phenytoin. Role of IVIG in therapy is controversial with some papers reporting good outcomes and others reporting no improvement. , Our patient did not improve with IVIG. Plasmapheresis as a modality of treatment has not been reported in the literature. Our patient responded significantly to plasma exchange. This report thus adds one more choice for the management of these patients. We report this case to draw attention to a rare disease with multisystem involvement. Accurate diagnosis of this condition can only be accomplished by a high degree of suspicion. Presentation with incomplete manifestation of the components of the syndrome can lead to misdiagnosis of this potentially treatable disease. Satoyoshi E, Yamada K. Recurrent muscle spasms of central origin: A report of two cases. Arch Neurol 1967;16:254-64. Asherson RA, Giampaolo D, Strimling M. A case of adult-onset Satoyoshi syndrome with gastric ulceration and eosinophilic enteritis. Nat Clin Pract Rheumatol 2008;4:439-45. Ikeda K, Satoyoshi E, Kinoshita M, Wakata N, Iwasaki Y. Satoyoshi's syndrome in an adult: A review of the literature of adult onset cases. Intern Med 1997;37:784-7. Heger S, Kuester RM, Volk R, Stephani U, Sippell WG. Satoyoshi syndrome: A rare multisystemic disorder requiring systemic and symptomatic treatment. Brain Dev 2006;28:300-4. Mukhopadyay D, Ghosh A, Mukhopadyay M. Satoyoshi syndrome. Ind Ped 2011;48:729-30. Ashalatha R, Kishore A, Sarada C, Nair MD. Satoyoshi syndrome. Neurol India 2004;52:94-6. Matasuura E, Matsuyama W, Sameshima T, Arimura K. Satoyoshi syndrome has antibody against brain and gastrointestinal tissue. Musc Nerv 2007;36:400-3. Satoh A, Tsujihata M, Yoshimura T, Mori M, Nagataki S. Myasthenia gravis associated with satayoshi syndrome: Muscle cramps, alopecia, and diarrhea. Neurology 1983;33:1209-11. Noguchi Y, Fuchigami T, Morimoto S, Harada K. Myasthenia gravis with alopecia totalis. Acta Paediatr Jpn 1998;40:99-101. Kinoshita M, Nakazato H, Wakata N, Satoyoshi E. Myasthenic neuromyopathy. An unusual neuromuscular disorder. Eur Neurol 1982;21:52-8. Hart IK, Maddison P, Newsom-Davis J, Vincent A, Mills KR. Phenotypic variants of autoimmune peripheral nerve hyperexcitability. Brain 2002;125:1887-95. Arita J, Hamanos S, Nara T, Maekawa K. Intravenous gamaglobulin therapy for Satoyoshi syndrome. Brain Dev 1996;18:409-11. Kamat D, Petry L, Berry S. A case of Satoyoshi syndrome: A multisystem disorder. Clin Pediatr (Phila) 2003;42:745-8.